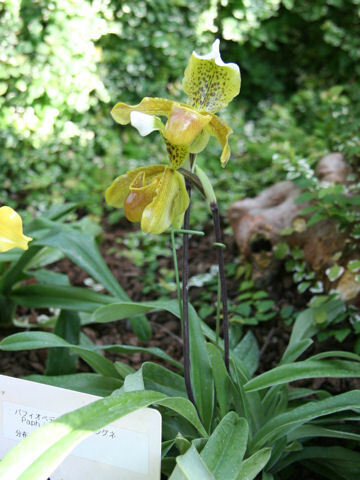 Pahiopedilum insigne belongs to Orchidaceae (Orchid family). It is an evergreen perennial herb that is native to northeast India. This herb is terrestrial and occurs in the mountains at 1000-1500 m elevation. The leaves are green and linear oblong. The flower is borne singly on a side-upward spike and 8-10 cm across. 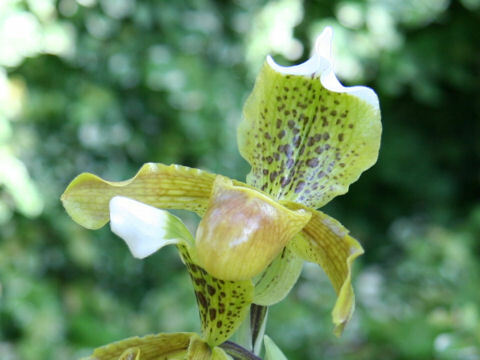 The dorsal sepal is greenish yellow with reddish brown spots, the petals are broad linear, greenish yellow and spotted reddish brown, the lip is yellowish brown.